“There are young people out there facing much tougher challenges in their days – and not by choice”. We recently interviewed Philip Coldwell, General Manager, Netwealth Investment about his participation in last year’s Wheel Classic. Phillip said the highlight of the experience was the camaraderie and team work amongst the group and the satisfaction of contributing to organisations and young people in the greatest need. Philip’s employer, Netwealth also generously sponsored the event. Register and start your training for the 2019 Wheel Classic today. 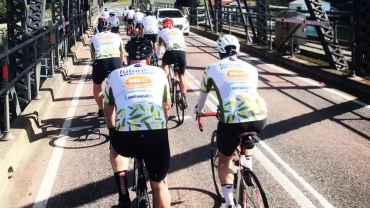 This year’s route will see our riders set off from Federation Square, Melbourne on 22 November toward the Daylesford Ranges and onto the Goldfieds, the Amy Gillet Fondo route and along the Great Ocean Road before returning to Melbourne in time for the start of the 2019 FPA Professionals Congress on 27 November. You can choose from a 6, 4 or 3-day ride.